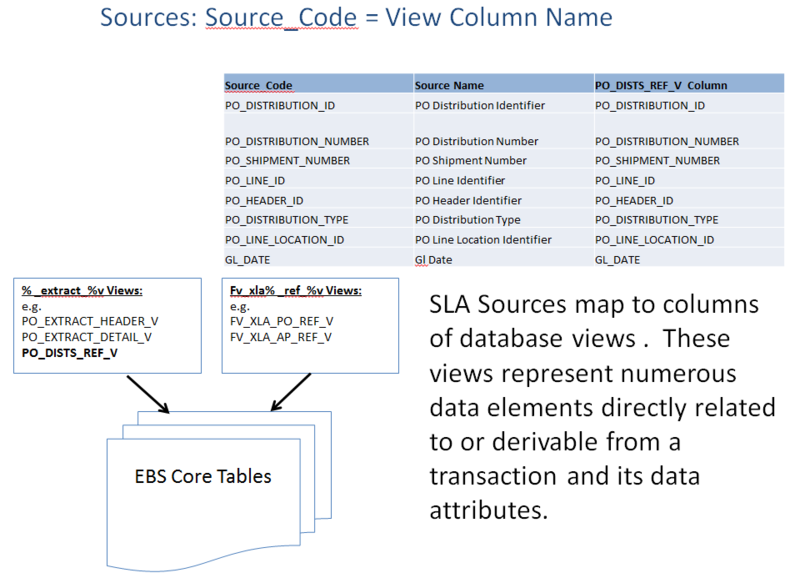 One of the most fundamental components of the R12 Subledger Accounting Architecture (SLA) is the concept of SLA Sources. There is a good bit of documentation on many SLA components, including my prior OAUG Presentations on SLA, but good explanations of SLA sources are a bit harder to find. So I thought I’d take a shot at helping spread better understanding with this post. dynamically generated or calculated during XLA Event processing and temporarily populated into a global temporary table for use by the XLA processing engine, e.g. the Upward Prior Year Adjustment Amount calculated for an AP Invoice matched to a PO distribution where the invoiced quantity exceeds po distribution quantity within tolerance (fv_extract_detail_gt.acc_unpaid_obl_pya_amount). The Sources available for an Application (e.g. 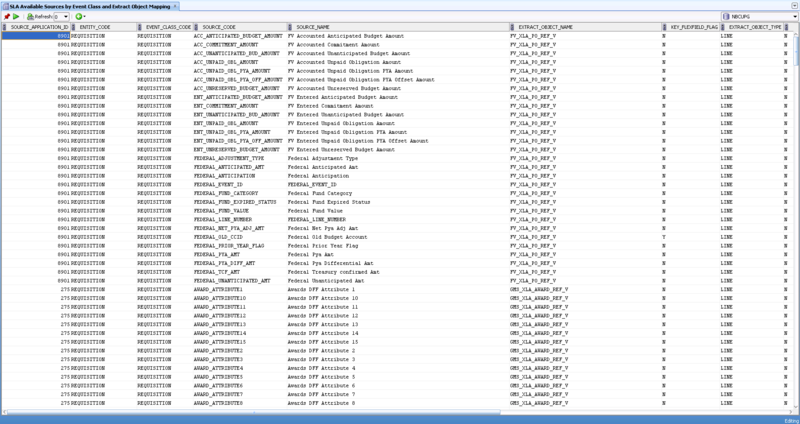 Purchasing) and the Source Assignments to Application Event Classes (e.g. Purchasing Requisitions) can be queried by navigating Setup > Subledger Accounting Setups > Accounting Methods Builder > Sources > Sources or …. > Sources > Source Assignments. Great, right?? Well, being the control-freak I can be sometimes, I really needed to know more. What tables or whatever are these Sources pulling from? How are they getting their values? 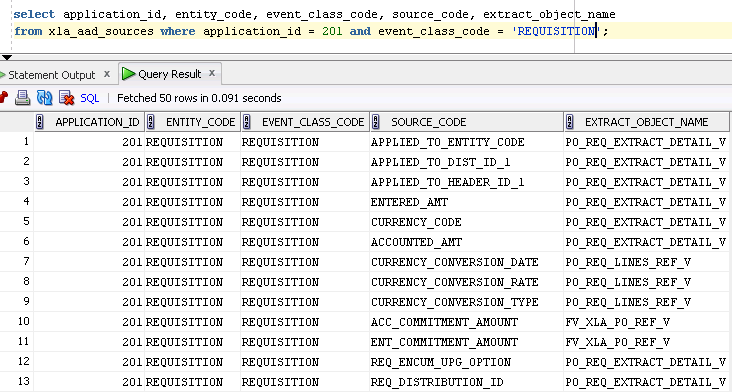 Furthermore, here is a query I’ve developed to be able to analyze the universe of various SLA sources available by Entity and Event Class (these are bind variables in the query) in SQL Developer: Available SLA Sources by Event. So that’s it, right? Well, not quite. Some views are simple to deconstruct to find the source data, whereas others point to tables like FV_EXTRACT_DETAIL_GT (for Federal Financials). 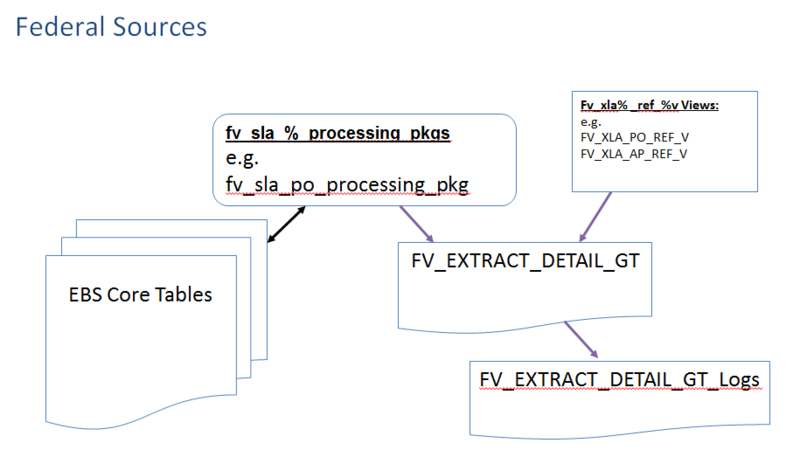 For example, the FV_XLA_PO_REF_V is like: select …. prior_year_flag…. from fv_extract_detail_gt. This table wasn’t something I was familiar with. The …gt (Global Temporary) tables are tables that are temporarily populated during XLA event processing by some PL/SQL logic and then those derived/calculated values are made available to the XLA event processing engine via the views looking at the ..gt tables. For example, when the XLA event processing engine detects the EBS environment is a federal environment, the XLA event processing will engage an FV “hook” which will then execute add’l FV-specific code as part of the XLA processing. An example, is when the FV_SLA specific code will look at the BFY on a transaction vs the Period Year of the event being processed and then determine if the transaction is a Prior Year (prior_year_flag will be set to ‘Y’) or a Current Year transaction (prior_year_flag will be set to ‘N’). Then an agency’s JLTs (& the standard Federal JLTs) can look at the Federal Prior Year Flag source value to determine if an Upward/Downward Accounting adjustment may be necessary. For troubleshooting SLA, typically the values written to fv_extract_detail_gt can’t be analyzed outside of the XLA event processing db session, however there is an option to dump the source values written to a fv_extract_detail_gt_logs table if the FV: Debug profile is set to Yes. Kindergarten stuff, right?? Hope this helps and good luck. This helped with my understanding. Thanks. This was very helpful, thanks for sharing!! Its not my first time to visit this web page, i am browsing this website dailly and obtain fastidious data from here everyday.